Dr. Henry Pym discovers “Pym Particles” and shrinks himself to ant-size for the first time. Eventually he creates the Ant-Man costume (and perhaps more importantly, a cybernetic helmet allowing him to communicate with insects), and begins fighting crime. 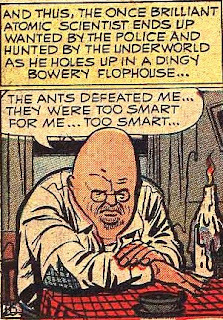 Late in the year he first faces his eventual arch-enemy, the criminal scientist Egghead. The alien Skrulls begin infiltrating and impersonating Earth super-humans (eventually leading to a large scale “secret invasion” five decades later) but are repelled by the Fantastic Four. Shortly afterwards, the FF set up headquarters in the top five floors of New York City’s midtown Baxter Building. Susan Storm creates hero uniforms (costumes) and they battle the criminal hypnotist, the Miracle Man. Days later while passing through the Bowery, Johnny Storm restores the memory of Namor the Sub-Mariner, the amnesiac lost prince of underwater Atlantis. Namor discovers his home in ruins and his people gone (due to an attack many years ago by the evil telepath "Destiny") and mistakenly believes it to be from nuclear bomb tests - he begins his war against humans using the monster-summoning Horn of Proteus. 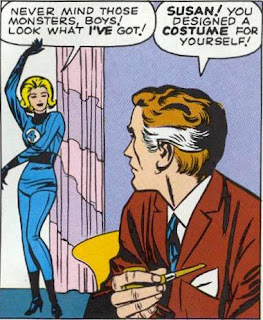 The FF repel his first major attack, but not before he attempts to sweep Sue Storm off her feet. Scientist and mystic Victor Von Doom (now calling himself Doctor Doom) attacks the FF and forces them to travel back in time to Blackbeard's time, but is eventually defeated. The FF take Doom's time travel device back to their Baxter Building HQ. Later, Doom convinces the Sub-Mariner to join forces with him and they pull the entire Baxter Building into space. Doom then betrays the Sub-Mariner, after which Namor defeats Doom and sends him literally into orbit. Back on Earth, Johnny Storm first battles the mad scientist the Wizard, who will later prove to be a very tenacious foe when he forms his own super-team. Late in the year, the FF battle Philip Masters, the Puppet Master, who controls people using radioactive clay (sourced from Wundagore Mountain and linked to the elder god Chthon). 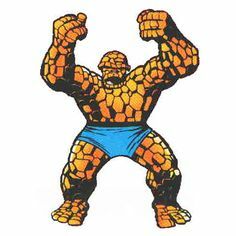 Masters’ step-daughter Alicia (whose blindness was the result of an accident he himself had caused) meets Ben Grimm and they begin an unexpectedly robust relationship. The Human Torch discovers the invasion plans of Xemu, a conqueror from another dimension (the “5th Dimension”) and is captured. However, Valeria and her father Phineas (members of a native resistance movement) help him escape and defeat Xemu. In New Mexico, Gamma radiation specialist Dr. Bruce Banner is caught in a Gamma bomb explosion while rescuing teenager Rick Jones - the radiation transforms him into an inhumanly strong and belligerent "Hulk". Banner develops feelings for Betty Ross, but Betty's father, General Thaddeus "Thunderbolt" Ross, begins hunting down the Hulk, not knowing his true identity. The Hulk is almost immediately kidnapped by the Gargoyle, a Russian mutant, but Banner “cures” him through radiation. Bruce Banner experiments with gamma radiation and succeeds in retaining his own personality when transforming into the Hulk – however with a somewhat belligerent edge. The Stone Men from Saturn (actually from a base on one of Saturn’s moons) land on Earth. Dr. Donald Blake is on vacation in Scandinavia and discovers an hidden cave and the enchanted hammer Mjolnir inside. He transforms into the Asgardian God of Thunder, Thor, and repels the aliens (in actuality, years ago Thor was exiled to Earth and made to live as the human "Donald Blake" in order to learn humility). After returning to NY, he becomes infatuated with nurse Jane Foster at his practice. Thor returns to Asgard, home of the Norse Gods, and reunites with Odin. Thor’s brother Loki, the God of Mischief, tricks Heimdall the bridgekeeper into releasing him from his prison. He attacks Thor on Earth but is beaten and sent back to Asgard. Scott Summers accidentally unleashes his mutant powers (force-beam-emitting eyes) in public and incites fear and hatred from bystanders. Charles Xavier (the psychic Professor X), searching out other mutants, convinces him to become his first student "X-man" in Westchester NY and take the codename Cyclops. Bobby Drake is also a victim of mutant bigotry in his town for his ability to freeze things and spontaneously create ice, but Cyclops and Xavier rescue him. He becomes the 2nd member of Xavier's new school for mutants, and takes the codename Iceman. In NY, high school student Peter Parker is bitten by an irradiated spider and gains spider-like superpowers. He creates mechanical web-shooters and promptly enters show business. Peter’s Uncle Ben is later murdered, in part thru Peter's negligence. He resolves to fight crime as "Spider-Man" to make up for his terrible mistake. AIM (Advanced Idea Mechanics) goes public as an international think tank.